Pit bulls get a bad rap. The truth is, when well-bred and properly socialized, pit bulls are very friendly, people-oriented pets. With their high energy level and strength, though, pit bulls are not for everyone. But if you decide that the pit bull is a good fit, you will find them to be extremely intelligent and eager to learn. They often excel at obedience training and dog sports. Unfortunately, what many people know about pit bulls comes from the news stories they hear about dog fighting or pit bull attacks. This is one of the reasons it is so important to make the extra effort to train your pit bull. A well-trained pit bull can be an ambassador for its breed, showing the world that with a loving home and training, pit bulls can make wonderful pets. If you have a young pit bull puppy or are planning on getting one soon, make socialization your top priority. It is important that your pit bull puppy learns to be comfortable with a variety of people and situations from a very early age. Expose it to children, men, women, and other animals. Get your pet used to being handled. Keep things positive and upbeat, and allow your pit bull puppy to approach new things in its own time. This early socialization is the most important component of your puppy's training program. Because of their muscular build and strength, training that requires leash corrections or other punishment is not always effective with pit bulls. You will probably have better results with positive reinforcement techniques, such as clicker training or other reward-based training. Most pit bulls are eager learners and will be happy to work for the rewards. Because pit bulls have a history of being bred as fighting dogs, they are not always tolerant of other dogs. You can keep control over your dog in the presence of other dogs by teaching it to focus on you. This is when the "look" command comes in handy. Other commands that can help include stay, come, and the emergency recall. To ensure that your dog will respond to your commands, even when it may be distracted by other dogs, take the time to practice commands in a variety of settings and situations. It's important that your dog can respond to your commands when you are at the park just as well as it does in your living room. This step of training is referred to as proofing. It's important to remember, however, that each dog is an individual. Some do well in households with other dogs, while others show aggression toward other dogs. It can't be stressed enough that aggression toward dogs does not equal aggression toward humans. Just because a pit bull is intolerant of other dogs does not mean it is going to be aggressive toward people. The Canine Good Citizen Program was developed by the American Kennel Club (AKC). It involves testing your dog on several skills, and if it passes the test, the dog gets a Canine Good Citizen certificate from the AKC. To pass the test, your pit bull must know some basic obedience skills, be able to walk through a crowd, accept being petted by strangers, and not react to other dogs it passes. You also must sign the Responsible Pet Owners Pledge. Any dog can benefit from the Canine Good Citizen Program. 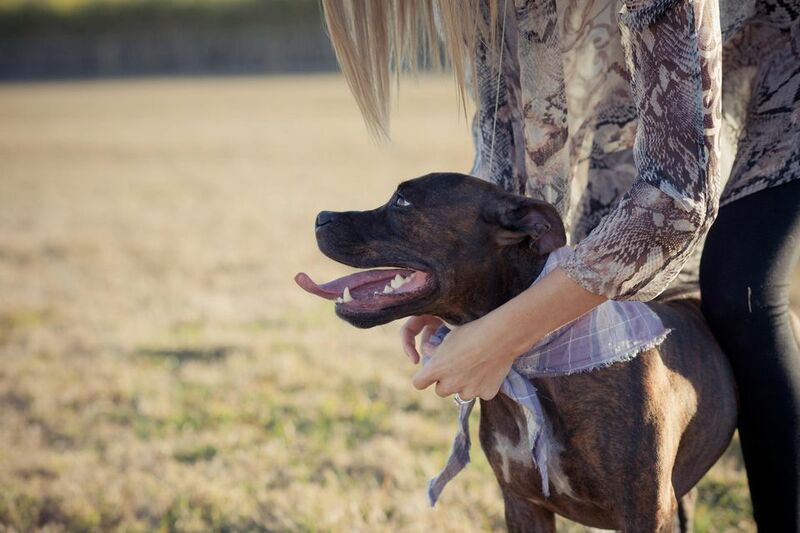 For pit bulls, it can also provide proof that you have a well-behaved, friendly pet. It is something you can show potential landlords or neighbors as proof that your dog is a good canine citizen. It's just one more step in changing the public's perception of the pit bull as a vicious dog. The American Kennel Club website can help you find Canine Good Citizen classes and evaluators. Pit bulls are usually energetic and fun to train. Many of them do well in advanced obedience and dog sports, such as agility or rally obedience. These activities are a great way to have fun and bond with your pit bull and reinforce good behavior at the same time. Advanced obedience and dog sports have the added benefit of offering the perfect combination of exercise and mental stimulation that these active and intelligent dogs crave. A well-trained dog will be able to take its cues from you rather than reacting to the presence of another dog. If you are having trouble keeping your dog from showing aggression toward other dogs, consider working with a trainer. A lot of training facilities offer classes to help with just this problem. You may see them referred to as Feisty Fido or reactive dog classes. When it comes down to it, pit bulls are really no different when it comes to training than any other dogs. The difference comes from the public's perception of pit bulls. Take the time to train your pit bull, and you will have a happy and healthy member of the family who is truly an ambassador of its breed.